A few weekends ago I had the great privilege of helping put together a bridal shower for a dear friend I’ve known since elementary school. I had just finished BlogShop when her sister and I were deciding the details and I was a little mood board obsessed (still am). I found these invitations (via Minted) a long time ago that I was dying to use, and since the bride lives in Omaha, I thought the idea of throwing a linen shower to keep all the gifts light for transport back on the plane was a brilliant idea. Turns out, though, that the idea of a “linen shower” had some guests very confused and wondering if they were supposed to bring a towel or their own towel or what linens were. Ha! At least there was a little suspense surrounding the shindig — makes it all more interesting! I found a lot of great decor on the Ikea website and surprisingly, didn’t really need much else. 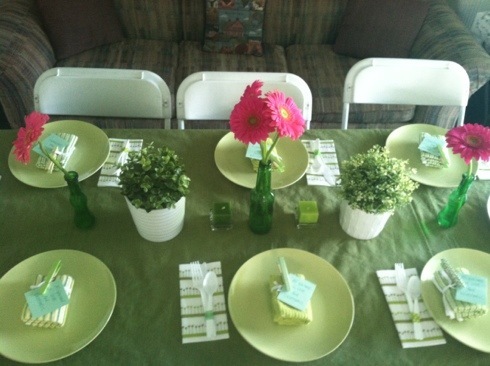 We were able to reuse green plates from our wedding,the bride’s mom had some darling hot pink champagne flutes from another party, and I scored some awesome green tablecloths on clearance at Target. Plus, I found a bunch of ways to use washi tape (via cutetape.com) to keep with the modern green theme from wrapping the utensils, decorating the plain white cups, and covering the clothespins. I’m not usually one for shower games, but the bride’s sister came up with a clever way for everyone to play without any humiliating moments — guess the celebrity bride. 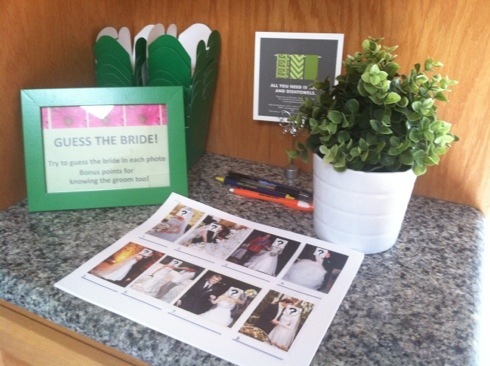 Everyone received a printout of photos of celebrity brides and grooms with the faces covered up. One point for the bride and another if you could name the groom. It was really fun. The favors were little dishtowels with a little notecard that said “All you need is love. 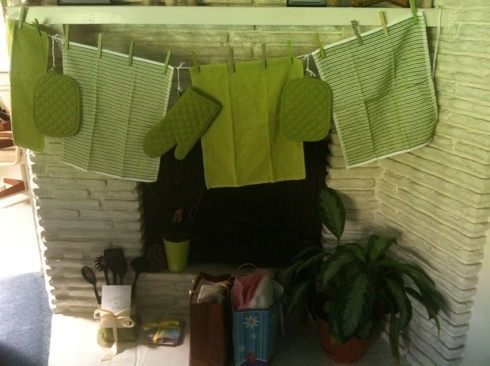 And dishtowels” secured with one of the handy clothespins in keeping with the theme on the invitation. 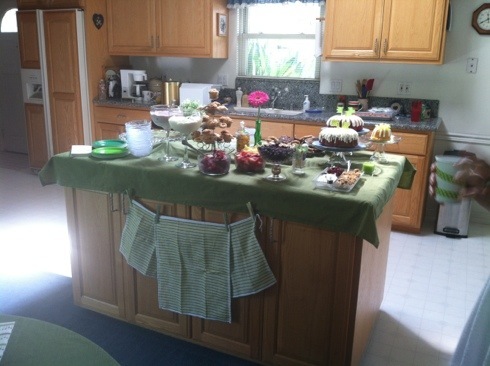 And we even used dishtowels, potholders and oven mitts to create cute little backdrops on the food table and mantle. 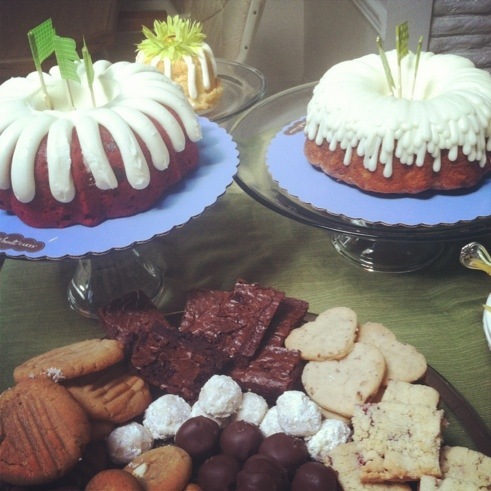 For brunch we had a yogurt bar with add your own fruits, nuts and granola toppings, mini quiches, pastries and sausage balls, and for dessert a cookie platter made by my mom and cakes from Nothing Bundt Cakes. Yum! « Happy April Fool’s Day!